The backdrop to Palestine’s accession to the ICC is crucial. On the one hand, it is part of a shift on the Palestinian Authority’s part from the US-led peace talks and towards a diversified international law approach. As decades of bilateral peace talks proved fruitless, Abbas and his constituents have opted for utilizing all the tools of the multilateral system to internationalize their case and make headway on the global stage—and thus boost their leverage in future negotiations. Their first major victory came in November 2012 when the UN General Assembly voted overwhelmingly to give Palestine “non-member observer state” status. The 138 votes in favor and only nine against indicated a major change in the international community’s stance on the issue—as well as de facto recognition of Palestinian statehood. Yet the move must also be seen from another vantage point: a broad-based strategy that seeks legal accountability and justice. The top Palestinian leadership has been pursuing this through advocacy at the UN General Assembly, the UN Human Rights Council, and elsewhere while civil society has made various noteworthy breakthroughs, notably with the Boycott, Divestment, and Sanctions (BDS) movement. Initially a grassroots movement that emerged in 2005, this is now truly global with various governments, civil society groups, and universities recognizing its activities and complying with its mission. Among other things, such campaigns portend the increased isolation of Israel, the fear of which is palpable amongst policymakers in Tel Aviv. The most significant aspect of the timing of Palestine’s accession to the ICC is that, according to the court’s registrar, jurisdiction would date back to June 13, 2014. This effectively opens the possibility for prosecutors to investigate the 50-day war between Israel and Hamas militants in Gaza in the summer of 2014, which killed 2,100 Palestinians (1,462 civilians according to the UN) and 73 Israelis (six of whom were civilians). Despite the fact that Israel is not an ICC member, the Hague-based court still has the right to exercise jurisdiction over war crimes, crimes against humanity, and genocide committed on Palestinian territory. In effect, the Palestinians can bring forth cases pertaining to Israel’s other alleged violations—from building illegal settlements in the West Bank to various human rights abuses—as opposed to just crimes committed in an armed conflict. The symbolism and choreography may be more important to the Palestinian authorities than the legal implications. In other words, while cases might be brought forth to the court, history has shown the limits of international law when applied to the Israeli-Palestinian issue, be it the competing interpretation of UN Security Council Resolution 242—which called on Israel to withdraw from “territories occupied” in the Six Day War of 1967—or the more recent largely ignored 2004 ruling of the International Court of Justice’s (ICJ) Advisory Opinion which found the Israeli construction of the Wall in the occupied territories to be illegal. 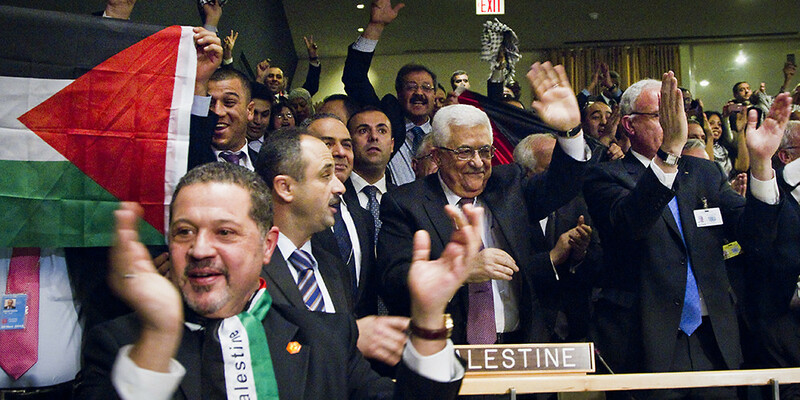 Palestine’s joining the ICC has already ruffled some feathers. Israel immediately retaliated by freezing some 127 million USD in tax revenue due to the Palestinian Authority, and the US Congress is threatening to withhold 440 million USD in aid. Both have the power to negatively affect the Palestinian populace at large—which could cause the ICC bid to backfire domestically. Looking Forward: Prospects for Peace? Seeking ICC membership is not itself a strategy for making peace between Israel and Palestine. At best, it is a tactic which gives the latter more leverage in the international arena as well as a potential step forward at attaining accountability and justice. At worst, it is a last ditch effort by a fatigued authority to use whatever tools remain at its disposal. And yet the overall “legal accountability” approach—from the ICC to BDS—could create necessary momentum for a more conclusive peace that has the backing of the vast majority of the international community. The Palestinians cannot manage this alone. Any peace deal must have the concerted backing of key Arab states to hold, given the volatile political climate in the Arab world today. Solving the Israeli–Palestinian dispute once and for all lies in a regional solution. The most recent Arab-driven solution has been shelved for over a decade: the 2002 Arab Peace Initiative, which offered Israel peace and normal relations with all Arab countries if Israel withdraws from all areas occupied in the 1967 war and attains a “just solution” to the Palestinian refugee problem. Not only would this address the legal grievances for Palestinians but it also presents hope for a more stable Middle East.